Google Doodle today celebrates the birth anniversary of eminent Kathak dancer Sitara Devi. Born on November 8, 1920, Sitara Devi has been described as Nritya Samragini by Rabindranath Tagore when she was just 16 years old. Born in Kolkata, Sitara Devi's family was originally from Varanasi. Sitara Devi's father Sukhdev Maharaj was also a Kathak dancer and a scholar of Sanskrit. Sitara Devi's mother Matsya Kumar was related to the royal family of Nepal. Over the years, Sitara Devi performed all over India and abroad, including prestigious venues like Royal Albert Hall, London (1967) and the Carnegie Hall, New York (1976). The success in Sitara Devi's professional life did not reflect in her personal life. 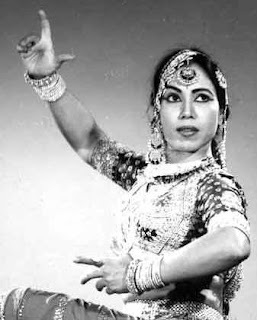 Sitara Devi was married twice and both marriages ended bitterly, leaving her wedded to her first passion, dance. Some of Sitara Devi's famous students were Madhubala, Rekha, Mala Sinha and even Kajol among many more. Sitara Devi desired to set up a Kathak dance academy in Mumbai, but got no land from the government. However, in 2002 when Sitara Devi was awarded the Padma Bhushan she turned it down saying "it is my insult and not an honour". News agency PTI quoted Sitara Devi as saying, "I will not accept any award less than Bharat Ratna." Sitara Devi passed away on November 25, 2014. Yesterday 7th Nov … was a great day, the Nation should have remembered and celebrated and I was waiting to see a doodle at least as Google did in 2013. Yesterday there was much ado about a past primetime actor asking his fans to contribute crores to make a political party and some had time to relate the birthday of the heroine of Bahubali, turning out to be one of the highest-grossing films ever because of its phenomenal collection at the box office and on her personal life .. .. .. but ! ~ this is what went missing ..
That path-breaking invention which was to honour and make him a Nobel Laureate – the invention itself came to be known after him ~ it was the inelastic scattering of a photon. When photons are scattered from an atom or molecule, most photons are elastically scattered, such that the scattered photons have the same energy (frequency and wavelength) as the incident photons. Here is an extract of the Presentation Speech by Professor H. Pleijel, Chairman of the Nobel Committee for Physics of the Royal Swedish Academy of Sciences, on December 10, 1930……. The Academy of Sciences, has resolved to award the Nobel Prize in Physics for 1930 to Sir ____________________for his work on the scattering of light and for the discovery of the effect named after him. The diffusion of light is an optical phenomenon, which has been known for a long time. A ray of light is not perceptible unless it strikes the eye directly. If, however, a bundle of rays of light traverses a medium in which extremely fine dust is present, the ray of light will scatter to the sides and the path of the ray through the medium will be discernible from the side. We can represent the course of events in this way; the small particles of dust begin to oscillate owing to electric influence from the ray of light, and they form centres from which light is disseminated in all directions. The wavelength, or the number of oscillations per second, in the light thus diffused is here the same as in the original ray of light. But this effect has different degrees of strength for light with different wavelengths. It is stronger for the short wavelengths than for the long ones, and consequently it is stronger for the blue part of the spectrum than for the red part. Hence if a ray of light containing all the colours of the spectrum passes through a medium, the yellow and the red rays will pass through the medium without appreciable scattering, whereas the blue rays will be scattered to the sides. Sure no more clues and a brilliant google doodle today to honour our own Sir CV Raman. Sir Chandrasekhara Venkata Raman, FRS was born on 7th Nov 1888 and lived till 21st Nov 1970. The great Indian physicist’s work was influential in the growth of science in India. He was the recipient of the Nobel Prize for Physics in 1930 for the discovery that when light traverses a transparent material, some of the deflected light changes in wavelength. This phenomenon is now called Raman scattering and is the result of the Raman effect. Venkata Raman was born in Thiruvanaikkaval, Trichinopoly [nearer Thiruvarangam – at Trichi]. His parents were R. Chandrasekhara Iyer and Parvati Ammal. He was the second of their five children. At an early age, Raman moved to the city of Visakhapatnam. His father was a lecturer in mathematics and physics at Presidency College in Madras, which Raman entered in 1902 at the age of 13. In 1904 he passed his B.A. examination in first place and won the gold medal in physics, and in 1907 he gained his M.A. degree with the highest distinctions. In 1917, Raman resigned from his government service after he was appointed the first Palit Professor of Physics at the University of Calcutta. At the same time, he continued doing research at the Indian Association for the Cultivation of Science (IACS),Calcutta, where he became the Honorary Secretary. Raman used to refer to this period as the golden era of his career. On 28 February 1928, Raman led experiments at the IACS with collaborators, including K. S. Krishnan, on the scattering of light, when he discovered the Raman effect. Mr K. S. Krishan, surprisingly did not share the award, but is mentioned prominently even in the Nobel lecture. He also started a company called Travancore Chemical and Manufacturing Co. Ltd. (now known as TCM Limited) which manufactured Pottasium chlorate for the match industry. The Company subsequently established four factories in Southern India. In 1947, he was appointed as the first National Professor by the new government of Independent India. He died in 1970, in Bangalore, at the age of 82. Sir Raman was the paternal uncle of Subrahmanyan Chandrasekhar, who later won the Nobel Prize in Physics (1983) for his discovery of the Chandrasekhar limit in 1931 and for his subsequent work on the nuclear reactions necessary for stellar evolution. India celebrates National Science Day on 28 February of every year to commemorate the discovery of the Raman effect in 1928. Google celebrated his 125th birth day in 2013 with a special doodle.